My work in online learning has been informed by my own first hand experiences as an online learner. In 2004 I signed up for a 100% online graduate program called Adult Learning and Global Change (ALGC) involving students and instructors from four universities around the world – University of British Columbia (Canada), Linköping University (Sweden), University of the Western Cape (South Africa), and University of Technology, Sydney (Australia). Students from around the world enroll in the program through one of the four universities. Courses are taught by faculty at all four universities giving students a rich range of experiences with adult learning and pedagogies from different countries. Throughout the two year program I got to know my fellow cohort of students really well as the online coursework involved extensive discussion and team-based learning assignments. Some of the students have become lasting friends. For those of you who have never taken an online course you may find it odd that a 100% online program could result in strong social bonds but my experience of this program was that the learning was far more social than any campus based classroom lecture I ever attended. While still a student in this program I heard about a group of graduates from an earlier cohort who expressed interest in meeting each other face-to-face. Among themselves they organized a meeting in South Africa. This meeting was so successful that those participating decided to continue to organize a face-to-face gathering of ALGC students (both currently enrolled and alumni graduates) called the ALGC Institute every two years. In 2006, while I was still a student, the second ALGC Institute meeting was organized and took place in Vancouver. Students from my cohort and earlier ones came from around the world. It was fantastic! In 2008 I attended the ALGC Institute in Sweden. And I’ve just returned from the 2010 ALGC Institute in Australia. I thought I’d share a bit of my experience from this most recent ALGC Institute in Australia as a way of solidifying my own experience and as a way of describing how I’m still learning from this online program despite having graduated years ago. The Australia ALGC Institute was primarily organized by ALGC alumni students in Australia. I’m particularly grateful to Kirsty Foster and Barb McPherson for their dedication and efforts. The week long Institute is a wonderful mix of academic papers, site visits to different places involved with adult learning, presentations from ALGC students and alumni on their own adult learning work in their respective countries, and of course sight seeing and socializing. Accommodation is usually arranged in student dorms or other very affordable locations and meals are social communal affairs. My trip started with a flight from Vancouver to Sydney. Before the Institute began I had two days of sight seeing. On my arrival I walked from the Y Hotel on Hyde street where I was staying through the central business district down to the circular quay where I caught a ferry boat ride out into the Sydney harbour to Neutral Bay and back. 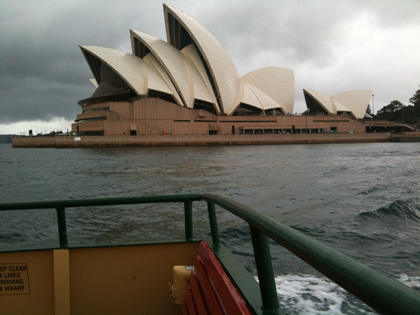 The Sydney Opera House is even more impressive than it appears in pictures. I went from summer in Vancouver to winter in Australia so it was odd to see bulbs coming up in the Sydney Royal Botanic Gardens. I checked out the Sydney Museum of Contemporary Art where I was totally impressed with aboriginal burial poles and bonsai art that integrated bonsai trees with vises and other metal tools. I ended my first day having yum cha (dim sum) at Marigolds in Chinatown. The next day I hooked up with other ALGC students from Sweden and Canada for a day long trip to the Blue Mountains outside of Sydney. 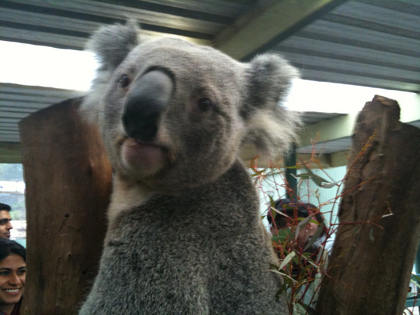 Our first stop was Featherdale Wildlife Park where we got up close to koalas, kangaroos, wombats, and emus. Featherdale started as a rehabilitation program for hurt and abandoned animals and now cares for over 2.200 animals representing the worlds largest collection of Australian native animals. From Featherdale we went to a local park where we all got to try our hand at boomerang throwing and learn about aboriginal culture. After a considerable drive we then took a guided walk to a spectacular cliff overlooking Jamison Valley with its sandstone cliffs and wild bush. It was great to experience the bush after the hub-bub of the city. From there we descended down into the valley via a flying cable car and had a guided walk beneath the canopy of the forest before ascending again via the world’s steepest railway. Next up a little shopping through the arts and craft shops in the charming town of Leura. The day ended with a cruise back into Sydney onboard the Rivercat which took us along the Parramatta River, under the Sydney harbour bridge, past the opera house and back to the circular quay. The first official day of the ALGC Institute began with us all meeting at Maroubra beach for a beach walk and hike out to the amazing rock formations on Magic Point where we could look for whales. We didn’t see whales but we did see dolphins playing in the waves with the surfers. Kirsty Foster hosted a wonderful lunch for us all in her home. 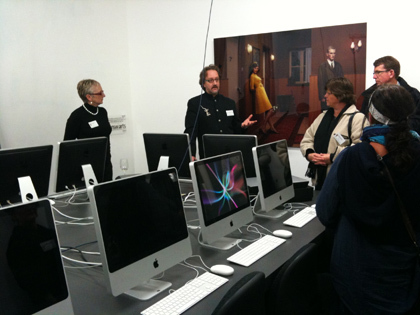 The official opening of the Institute took place that night at the Australian Centre for Photography where we given a wonderful reception and tour through their galleries and education facilities. The Australian Centre for Photography is Australia’s longest running contemporary art space and it was fascinating to hear Alasdair Foster describe its role in building community and fostering creative expression across all artistic endeavours. On Monday morning we gathered at the University of Technology Sydney. This university was the original Australian ALGC partner institution but it has since dropped out and been replaced with Monash University based in Melbourne. However when I was a student in the ALGC program the University of Technology was still involved so I was interested in seeing what it was like. This day was devoted to a series of academic papers and presentations. Tom Sork from the University of British Columbia in Canada gave a presentation/paper titled A Quibble of Lawyers: Negotiating the Complexities of International University Partnerships which explored the challenges and experiences involved in getting the ALGC program approved and formalizing agreements between the four universities involved in delivering it. It really is a very unique program. Garnet Grosjean from the University of British Columbia in Canada and a teaching faculty member in the ALGC program gave a presentation/paper on Developing Social Capital in Virtual Communities which drew upon research as well as practical experiences from the ALGC program. We then had a now for something completely different presentation from Elaine Swan from the University of Technology in Sydney called Tracks of My Tears – Therapeutic Cultures and Bodies of Truth which explored the social and therapeutic importance of crying including gender differences, crying at work, and media depiction of crying. After lunch I did a session on Architecting EdTech and Deo Bishundayal from the University of British Columbia in Canada did a session on E-Learning with Diversity which explored the dynamics that can emerge when students from very diverse backgrounds are placed in teams and asked to do a group assignment. The concluding session of the day was by Gunhild Carlsson an ALGC alumni student from Sweden who gave a fantastic presentation on her own personal arts research logging thinking and decision making while creating frescoes in Florence. 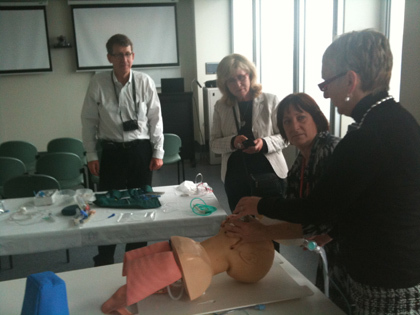 On Tuesday we went to the University of Sydney Clinical School – Skills & Simulation Centre. ALGC alumni student Kirsty Foster and her colleagues Jacquie Langeris and Sue Wulf hosted us for the day leading us through hands on sessions in the simulation centre. The labs in the simulation centre are equipped with dummies that provide an opportunity for medical professionals to acquire and practice skills such as monitoring and analysing heart rate and breathing and perform resuscitation. Using the dummies we got some hands on practise learning to to open up an air way, take a blood sample, do suturing, work as teams using the camera and utensils involved with laparoscopy surgery. We had a tour of the simulation theatre and saw the way in which a full operating procedure can be simulated along with the subsequent debriefing that the team receives on what went well an what didn’t. Beyond the eye/hand skills acquisition that can be gained I was delighted to learn of the communication simulations which provide an opportunity for medical professionals to practice things like giving bad news to patients where, in this case, the patients are actors who cry real tears. It was a tremendous privilege to see this simulation centre and learn more about adult learning in a medical context. At the end of this day we all flew from Sydney to Melbourne. On Wednesday morning we all went to Monash University the new Australian partner university in the ALGC program. Here more Australian based ALGC students currently enrolled in the program or recently graduated joined in on the activities. The day started with a warm welcome from Professor Terry Seddon, which was then followed by a presentation on Internationalising work and learning given by Tangerine Holt who supports the Monash Office of International Engagement in the management of and response to education and research related international activities. This presentation revealed the dramatic extent of growth Monash has undertaken in terms of setting up international campuses and recruiting international students a trend many universities around the world have followed. Kirsty Foster then gave a very moving presentation on Building Critical Care Capacity in Timor Leste through Education which looked at her own work supporting the development of critical care hospital skills in Timor as part of their recovery from brutal repression by Indonesia. Ann Christine Gustavsson, an ALGC alumni student from Sweden, then gave a presentation on her European Union funded work on the LYSA project involving workplace based training as a qualified complement to formal education. This project created a partnership of eight small communities in Sweden working together to develop an education and work placement program primarily for refugees. The program involved pooling teachers and students and using video conferencing to deliver the education across all eight communities. Industry participation resulted in a focus on developing skills and practical experience for participants in job areas with real employment opportunities such as work in a bakery, at a restaurant, house cleaning and as a personal assistant. The project has resulted in approx. 70% of participants getting employment. Mogomotsi Kenalemang an Monash ALGC student presented work from his thesis which explored workplace learning in Botswana particularly as it relates to work in the diamond mines there. And Julie Dyer from Monash University presented her preliminary research work on Building the International Self which looks at the personal impact international travel, work and experiences has on our self identity and perception of the world. The day ended with a community café bringing together ALGC Institute participants with Monash students pursuing a BEd in Adult Learning for discussions of provocative questions over afternoon tea. On Thursday we met Howard Errey, Kenneth Gooding, and Debbie Soccio who work for eWorks based in Melbourne. e-Works is an arms length business unit of the Kangan Batman Institute of TAFE. It is responsible for management of state and national initiatives related to the integration of information and communication technologies (ICT) in education and training initiated by the Australian Flexible Learning Framework. As e-Works has a lot of similarities to BCcampus, where I work, the session involved reciprocal presentations on our respective initiatives and general discussion among all about the similarities and differences. It was quite remarkable how similar many of our initiatives are. I was particularly impressed with e-Works TAFE Virtual Campus, Flexible Learning Toolboxes, and initiatives supported through their e-learning innovations fund. For Friday’s site visit we went to BlueScope Steel Manufacturing on the Mornington Penninsula outside of Melbourne. 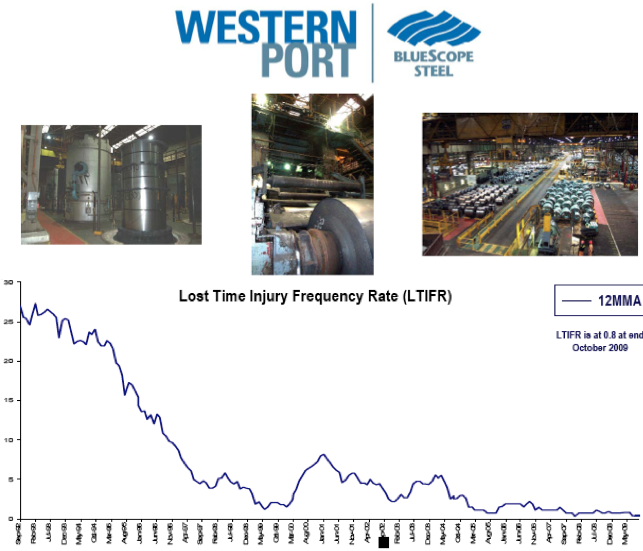 BlueScope has the best safety record of any steel company in the world. After an orientation and tour we met with staff responsible for training and safety to learn how they managed to achieve such a safety record. Their safety goal is “zero harm” and charts showing lost time injury frequency rate tell an impressive story of how their programs have dramatically reduced injuries. I was also impressed with their interest in reducing harm to the environment. After BlueScope we all went to Phillip Island where we visited Churchill Island Heritage Farm, a Koala Conservation Area, and watched the Penguin Parade at dusk when hundreds of penguins come out of the ocean and waddle along paths among the onlookers to their burrows. Amazing to be so close to them and to hear their calls. Friday night we all got together for a celebratory closing ceremony over pizza and wine before going our separate ways on Saturday. A wonderful compilation of photos and scenes from the Australia ALGC Institute was put together and distributed by Barb McPherson. This .pdf has lots more photos and all the participants. These ALGC Institutes are a kind of “edutourism”. Education becomes the lens through which you learn about the country. Instead of visiting chuches, museums, and other historic sites (although we do that too) the primary focus is on visiting places involved in adult learning. While in Australia I talked up the idea of doing a travel guide series based on this idea. Brenda suggested this could be called Learning Planet instead of Lonely Planet. I like that, so if you’re a travel guide publisher or an education enthusiast in another country and you’re interested in this idea, contact me. Can’t wait for the next gathering – South Africa 2012! What a superb recap of the 2010 ALGC Australian Institute, Paul! Good show. Great read Paul! Really captures the essence of the meeting and your reflections sum it up well. Look forward to seeing you both again. A very interesting account of your experiences! 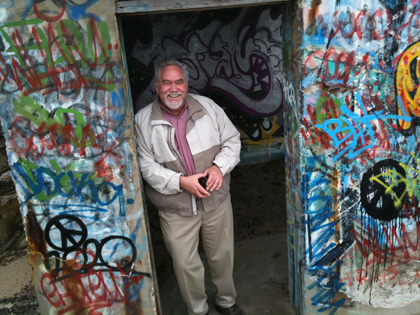 An excellent report on the ALGC Institute of 2010, Paul!